Discover an education in which you will explore, encounter, and question the world you know and the world in which you will make your mark. Experience the difference a Jesuit education will make in your life and the difference you will make in the world! Le Moyne offers more than 700 courses leading to Bachelor of Arts or Bachelor of Science degrees in more than 30 different majors. Le Moyne also provides courses of study leading to a master’s in business administration, education, nurse administrator, nurse educator, occupational therapy, physician assistant studies, arts administration, information systems, taxation, and family nurse practitioner. The College's Center for Continuing Education offers evening degrees, certificate programs and houses the Success for Veteran's Program. Approximately 2,500 full-time undergraduate students and 650 graduate students are enrolled at Le Moyne, with a ratio of 56% full-time undergraduate female and 44% full-time undergraduate male. Students (undergraduate, graduate, full-time and part-time) come from 30 states and 37 countries. The members of the Class of 2018 are set to make their mark on the world. Some will be heading back to the classroom to study medicine Georgetown University, public administration at Columbia University, bio-geo-chemistry at the University of Massachusetts, Amherst, and law at the University of William and Mary. Many will be entering the workforce, crunching the numbers at “Big Four” accounting firm EY, spreading the magic at the Walt Disney Co., and taking part in the early career development program at Lockheed Martin. Others will be enlisting as officers in U.S. Army and serving their fellow man in the Peace Corps. Whatever they do, these Dolphins will build lives rooted in meaning and success. 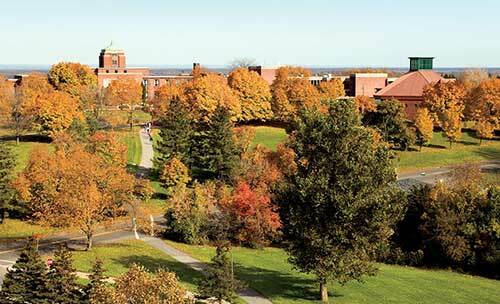 Le Moyne’s 160-acre, tree-lined campus is located in a residential setting 10 minutes from downtown Syracuse, the heart of New York state. Our 48 buildings include a variety of student residential housing, several academic and administrative buildings, a stand-alone chapel, library and performing arts center. 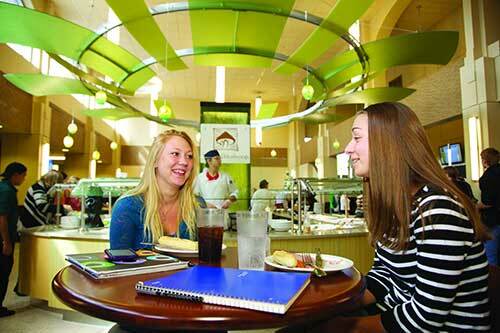 The Campus Center features the LaCasse Dining Center and the Campus Pub, while the Dolphin Den (located on the first floor of Grewen Hall) is a popular gathering spot, as is the Le Moyne Plaza. The lower part of campus features the Recreation Center, the Henninger Athletic Center, a multi-use turf field, and baseball and softball diamonds. Learn more about our facilities here. Among the prestigious graduate schools members of the Class of 2018 have been admitted to are American University, George Washington University, Johns Hopkins University, Boston University, Columbia University, Georgetown Medical School, Loyola Marymount University, Stanford University, Syracuse University, University of California at Berkeley, University of Oregon, University of Rochester and William and Mary College of Law. In addition, graduates have accepted jobs with a number of highly respected organizations, including Ayco, BNY Mellon, Dannible & McKee, Disney, Elmcrest Children’s Center, Eric Mower and Associates, Goldman Sachs, Hershey Co., IBM, Liberty Mutual, National Grid, Peace Corps, PricewaterhouseCoopers, Raymour and Flanigan, St. Joseph’s Hospital and Wegmans headquarters. Recent graduates are also volunteering their time with the Peace Corps, Center for Working Families, Jesuit Volunteer Corps, Jesuit Alumni Volunteer Program, and AmeriCorps. The Princeton Review ranked Le Moyne among the top 15 percent of Colleges in the nation for the fifth consecutive year and included the College in its guide, The Best 382 Colleges: 2018 Edition. In addition, for the 26th consecutive year, U.S. News and World Report included Le Moyne in its popular guidebook. It ranked the College number 17 in the Regional Universities North category, number six in its “Great Schools, Great Prices” listing and number eight in its “Best Colleges for Veterans” listing. Le Moyne’s information systems program was ranked number 18 in the nation by U.S. News and World Report. A total of 98 percent of recent Le Moyne graduates reported employment in a sector related to their major field of study or admittance to graduate school within a year of Commencement. During the College’s third-annual Giving Day, held on Feb. 28, 1,500 donors completed gifts totaling over $500,000 in just 24 hours, far surpassing a goal of 1,400 gifts. It was a banner year for the men’s basketball team, which earned a spot in the Division II Elite Eight and set a program record with 27 wins. The Department of Physician Assistant Studies received a $62,500 federal grant to help train health care professionals in combatting opioid abuse. More than 50 students representing over 20 academic disciplines shared the findings of the original research they conducted during Scholars Day. Le Moyne’s Upward Bound Program received a $1.9 million grant to help students from the Syracuse City School District prepare for and graduate from college. Since its establishment in 1965, Upward Bound has served more than 2 million students. Hilary McManus, Ph.D., associate professor of biological and environmental sciences, was one of 76 female scientists who traveled to Antarctica in February as part Homeward Bound. A first-of-its-kind program, Homeward Bound’s aim is to provide leadership and organizational training to 1,000 women with science backgrounds over the next decade so that they may influence public policy and dialogue regarding climate change and other environmental issues. The College introduced a new interdisciplinary bachelor’s degree program in cybersecurity that emphasizes research and experiential learning. The program draws from the departments of Computer Science, Political Science, and Anthropology, Criminology and Sociology. Students may choose from three concentrations: crime, society and culture; information and system security; and policy and law. Le Moyne was honored with the Ensuring Our Future Award from Cristo Rey New York High School. Since Cristo Rey was founded in 2004, 18 of its alumni have matriculated to Le Moyne. President Linda LeMura, Ph.D., was selected to serve on the transition team for Syracuse Mayor Ben Walsh, who took office in January. The College unveiled a new master’s degree program in taxation. Housed in the Madden School of Business, the program provides students with highly specialized training in tax research and planning. Delia Popescu, Ph.D., chair of the Department of Political Science, traveled to Rome, Italy, where she met with Pope Francis and participated in a conference titled “Migrants and Refugees in a Globalized World.” She and other leaders in academia and nonprofit organizations reflected upon their moral and professional responsibility to stem the suffering of migrants and refugees around the world. Leigh Fought, Ph.D., of the Department of History, earned the 2018 Herbert H. Lehman Prize for Distinguished Scholarship in New York History for her book Women in the World of Frederick Douglass. Douglas Egerton, Ph.D., of the Department of History, received a 2017 Choice Outstanding Academic Title Award for his book The Denmark Vesey Affair: A Documentary History. Le Moyne received a $100,000 award from the National Endowment for the Humanities, which will be used to develop a minor in values and professional ethics. Professor of Religious Studies Jennifer Glancy, Ph.D., awarded one of 78 fellowships for 2018 by the American Council of Learned Societies (ACLS). She is the first Le Moyne faculty member to be honored by the ACSL in more than 30 years, and joins professors from more than 50 institutions, including Harvard, Yale, Princeton, Dartmouth, Wellesley, Penn, Cornell, Brown, Notre Dame, and UC-Berkeley. Alumna Kimberlyn Bailey ’16 was awarded a Fulbright U.S. Student Program Study/Research Grant, which she will use to travel to Germany to study epilepsy. In rankings recently released by U.S. News & World Report, graduate nursing programs in the Purcell School of Professional Studies were ranked number 146 among 296 programs in the country that were profiled. The College partnered with one of the world’s largest financial institutions, BNY Mellon, to establish the new BNY Innovation Lab on campus. One of only a few comprehensive business analytics labs housed in an undergraduate business school in the U.S., it provides Le Moyne students with the opportunity to work on real-world issues encountered by a Fortune 500 company. A signing ceremony held on Dec. 18 at Syracuse University’s iSchool officially kicked off a partnership that will allow students in Le Moyne’s Master of Science program in information systems to take classes at Syracuse University (SU), and SU’s students to complete classes in Le Moyne’s Madden School of Business. The College unveiled Promise New York, a distinct career-readiness and scholarship program whose aim is to provide as many qualified, talented students as possible with access to a Le Moyne education. Under Promise New York, every incoming Le Moyne student from the state of New York will receive a $10,000 scholarship (in addition to any other need- or merit-based aid they receive). In addition, students will be kept on a path to complete their undergraduate degrees in four years, be assigned a mentor, complete an internship and have a job interview with an accomplished Le Moyne graduate. The women's lacrosse team made program history, winning its first national championship in defeating Florida Southern 16-11 at University of Tampa Lacrosse Stadium in Tampa, Fla. The Princeton Review ranked Le Moyne among the top 15 percent of Colleges in the nation for the fourth consecutive year and included the College in its guide, The Best 381 Colleges: 2017 Edition. In addition, for the 25th consecutive year, U.S. News and World Report named Le Moyne one of the top 20 colleges in the Regional Universities North category. A total of 1,326 individuals made a gift during the College’s second-annual Giving Day. A total of 74 percent of those donations came from alumni of the College, with the Classes of 1985, 1997, 1977, 2010 and 1981 leading the way. A total of 94 percent of members of the Class of 2015 responding to a survey reported being employed or admitted to graduate school within a year of Commencement. Recent graduates are also volunteering their time with the Center for Working Families in Quito, Ecuador, Jesuit Volunteer Corps, Jesuit Alumni Volunteer Program, and AmeriCorps. More than 55 students representing over 20 academic disciplines shared the findings of the original research they conducted during Scholars Day. Le Moyne welcomed the second-largest class in its history, the Class of 2020, at nearly 650 strong. Members of the class come from 14 states and seven foreign nations, with biology being the most popular declared major. Douglas Egerton, Ph.D., professor of history, was honored with the 2017 Gilder Lehrman Lincoln Prize for his book Thunder at the Gates: The Black Civil War Regiments That Redeemed America. The Lincoln Prize is awarded annually by Gettysburg College and the Gilder Lehrman Institute of American History for work that enhances the general public’s understanding of the Civil War era. For the third time in his Le Moyne career, head men’s lacrosse coach Dan Sheehan was named the national Division II Coach of the Year. Under Sheehan’s leadership, the Dolphins have won five national championships in the last 13 years. The College’s Quantitative Reasoning Center (QRC) received a $1.2 million grant from the New York State Regional Economic Development Council. The grant will contribute to the $7.5 million cost to develop the new home for the QRC within Le Moyne’s Noreen Reale Falcone Library. The Center will play a major role in cultivating this key competency, not only for Le Moyne students, but also for community and business partners throughout the Central New York region. Among the prestigious graduate schools member of the Class of 2017 have been admitted to are Northwestern University, Boston University, University of Georgia, Saint John’s University College of Law, SUNY Upstate Medical University, Lincoln Memorial University College of Veterinary Medicine, University at Buffalo Jacobs School of Medicine, University of Virginia, University of Missouri and Seattle University. In addition, graduates have accepted jobs with a number of highly respected organizations, including M & T Bank, Cornell University, Strong Memorial Hospital, Och-Ziff Capital Management, J.P. Morgan Chase, Northwestern Mutual, Audiobook Creation Exchange, and Ernst and Young. Members of the campus community gathered for the opening of the Palony Wellness Studios in the College’s Recreation Center. Named for Ann Palony ’65, the Studios will offer a variety of classes, including yoga, strength training and spinning. They were established in order to support students’ physical, emotional and spiritual health. The Madden School of Business named its third Center of Excellence – the Hetterich Center for Global Engagement and Impact. Named for alumnus F. Paul Hetterich ’84, the Center will leverage the unique connections between the 188 Jesuit institutions of higher learning around the world. Matt Bassett, assistant vice president and director of athletics, traveled to the Vatican to participate in Sport and Faith in the Service of Humanity, the first global conference on faith and humanity. The conference, which was blessed by Pope Francis, addressed the possibilities sport and faith have in combination with one another. The College launched its new branding campaign highlighting Le Moyne’s commitment to service and experiential learning. The campaign was developed by the Brooklyn-based creative agency Baiocco and Maldari, whose chief creative officer is Le Moyne alumnus Rob Baiocco ’85. Using the tagline Greatness meets Goodness, the branding is centered on four themes: values in action, think forward, meaningful success and become you. Over the next five years, Assistant Professor of Physics Christopher Bass, Ph.D., and his students will take part in a project funded by the Department of Energy Office of High Energy Physics that could help improve how the more than 400 nuclear reactors around the world are monitored and safeguarded. Hilary McManus, Ph.D., associate professor of biological and environmental sciences, was one of 76 female scientists selected to travel to Antarctica next winter as part of Homeward Bound. A first-of-its-kind program, Homeward Bound's aim is to provide leadership and organizational training to 1,000 women with science backgrounds over the next decade so that they may influence public policy and dialogue regarding climate change and other environmental issues. The first cohort of X students graduated from the College’s master’s degree program in occupational therapy during a ceremony held on Friday, May 19. The graduates were trained in a brand new 10,000-square-foot facility downtown that includes classrooms, labs, study spaces and faculty offices. 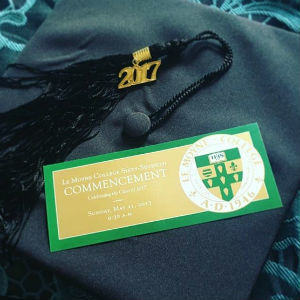 During Friday’s graduate commencement ceremony, the College also celebrated the accomplishments of the first 11 individuals to graduate from Le Moyne’s Family Nurse Practitioner Program. These professionals have been thoughtfully trained to provide outstanding community-based primary care to diverse, underserved populations. The College introduced a new bachelor’s degree program in professional studies that will aid working professionals in advancing their current careers or establishing new ones as they concentrate in either business or health related professions. Courses are offered year-round in evening, online and hybrid formats. Le Moyne launched the James F. Smith, S.J., Collegiate Scholars Program, which provides academic, financial and personal support to Le Moyne students. Students serve as interns at local corporations and, in return, those organizations agree to fund one-third of the cost of a student’s education. Students gain valuable professional experience; their sponsors add another outstanding communicator, collaborator and critical thinker to their team. Le Moyne College and Syracuse University announced a new academic partnership that will help enhance research and educational opportunities for students, faculty members and staffs at both institutions. The new partnership will focus on harnessing the potential of two distinctive areas of study by creating innovative collaborations. The College received a $1.2 million grant from the National Science Foundation to help teach science, technology, engineering and math undergraduate students. The funds will be used to recruit, enroll and prepare 21 undergraduate students in the STEM fields to obtain New York state teaching certification so that they may work in high-need school districts in Central New York. The Princeton Review ranked Le Moyne among the top 15 percent of colleges in the nation for the third consecutive year and included the College in its guide, The Best 380 Colleges: 2016 Edition. In addition, for the 24th consecutive year, U.S. News and World Report named Le Moyne one of the top 20 colleges in the North Regional Universities North category. The College completed a multi-year, four-phase refurbishment of the Coyne Science Center, one of two original buildings on campus. Among the features are new laboratories for student and faculty research, complete with state-of-the-art fume hoods and new countertops and cabinetry. Two tiered and four general classrooms, as well as faculty and administrative offices, were also part of the project. Several members of the board of trustees – along with President Linda LeMura, Ph.D., and Special Assistant to the President for Mission Integration and Development David McCallum, S.J., ’90 – traveled to Spain, where they followed in the footsteps of Saint Ignatius Loyola, the founder of the Society of Jesus. Their aim was to gain a deeper understanding of the spiritual foundations that inform Jesuit education. Among the stops they made was the cave in Manresa where Ignatius began to write the Spiritual Exercises, which serve as the foundation of the nearly 500-year-old religious order. Officials in the Madden School of Business formally launched the Global Jesuit Case Series, an online repository of business cases written by executives, entrepreneurs and educators from around the world emphasizing a holistic, values-centered approach to leadership. Colleen Fagan ’15 became the first Le Moyne graduate to receive a prestigious Boren Scholarship, which provides funding for students to study less commonly taught languages that are critical to U.S. national security. Fagan traveled to India, where she took intensive Hindi language classes and conducted public health research. The Purcell School of Professional Studies was named for two exemplary Le Moyne alumni, John ’65 and Kathy ’66 Purcell. The Purcell School incorporates some of Le Moyne’s most competitive and highly recognized programs, including physician assistant studies, education and nursing, as well as newer programs in occupational therapy and family nurse practitioner. John Purcell recently retired as chief executive officer of Fibertech Networks LLC, while Kathy Purcell is a clinic administrator at the Kirch Developmental Services Center in Rochester, N.Y. The members of the current freshman class, the Class of 2019, have the highest average ACT scores and GPA of any entering class at Le Moyne in the past six years. Derek Matina ’18 started a nonprofit organization, Sustainability for Scholarships that helps both the environment by collecting cans and bottles, redeeming them, and investing that money in scholarships for veterans. Brianna Natale ’16, a double major in psychology and biological sciences, was awarded a prestigious Fulbright U.S. Student Program Study/Research Grant to the Netherlands. Natale will enter a Behavioral Science Research Master’s degree program at Radboud University in Nijmegen, where she also plans to conduct research in the Developmental Psychobiology Lab. More than 1,000 individuals made a gift during the College's inaugural Giving Day, far surpassing the original goal of 250 donors in that time. Gifts came from as far away as Hong Kong, Australia and Switzerland internationally and San Francisco, Detroit and Washington, D.C., nationally. Three Le Moyne students – Elliott Connors ’16, James Gayvert ’17 and Ryan Bonk ’16 – were selected for a prestigious Summer Undergraduate Research Fellowship at the National Institute of Standards and Technology (NIST). Since 1993 the SURF Program has inspired undergraduate students to pursue careers in science, technology, engineering, and mathematics through a unique research experience that supports the NIST mission. 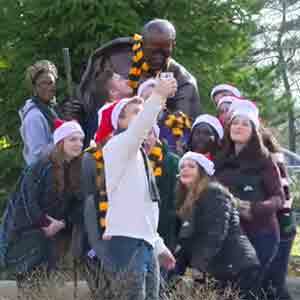 The College unveiled a new statue honoring the life of Saint Ignatius Loyola. The remarkable piece of art by sculptor Brian Hanlon is located in the heart of campus between the Panasci Family Chapel and Loyola Jesuit residence, and is intended to be a source of inspiration and a place of reflection for Le Moyne community members, as well as visitors to the College. A total of 92 percent of the members of the Class of 2014 responding to a survey reported being employed or admitted to graduate school within a year of commencement. CenterState CEO, an independent business leadership organization and economic development strategist, named Le Moyne the 2016 nonprofit organization of the year. The Madden School of Business named two of its center of excellence in honor of alumni – the Tim and Kathleen ’81 Keenan Center for Entrepreneurship and the Donald J. 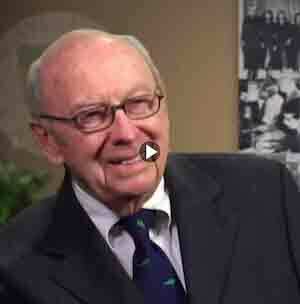 Savage Sr. ’51 and Family Center for Reflective Leadership. The Madden School’s third center is to be named in the fall. More than 45 students representing 20 academic disciplines shared their research during the 2016 Scholars Day. In addition, many of the students presented their work at professional conferences or had it published in scholarly journals. Douglas Egerton, Ph.D., professor of history, won the 2016 John T. Hubbell Prize for the best article published in the journal Civil War History in 2015. State Senator David J. Valesky recognized President Linda M. LeMura as the 53rd Senate District’s 2016 Woman of Distinction at a May 10 ceremony. The New York State Senate’s “Woman of Distinction” program was created in 1998 to honor New York women who exemplify personal excellence, or whose professional achievements or acts of courage, selflessness, integrity or perseverance serve as an example to all New Yorkers. In March 2015, the College inaugurated its 14th president, Linda LeMura, Ph.D., the first laywoman ever to lead a Jesuit college or university. More than 1,000 individuals, including representatives of approximately 50 colleges and universities from across the country, attended the installation ceremony. In Fall 2014, Le Moyne welcomed the Class of 2018, the largest in the College's history, at 687 strong. Colleen Fagan '15 became the College's first-ever recipient of a prestigious Boren Scholarship, which provides opportunities to study less commonly taught languages in critical regions of the world that are typically underrepresented in study abroad programs. Colleen will spend a year in Nepal working on public health and epidemiology initiatives. Taylor Glausen '15 and Angela Le '16 were two of 30 students recognized with undergraduate research awards from The American Physiological Society; only one other institution in the country (the Mayo Clinic) had two students win. For the second consecutive year, The Princeton Review ranked Le Moyne as one of the nation’s premier institutions for undergraduate education and included the College in its guide, The Best 379 Colleges. This places Le Moyne among the most elite institutions in the U.S., as only 15 percent of American colleges and universities are included in The Princeton Review’s national list. In addition, U.S. New and World Report recognized Le Moyne as one of “America’s Best Colleges” for the 23rd consecutive year. Service continues to be a hallmark of a Le Moyne education. In January 2015, Le Moyne received the Community Engagement Classification from the Carnegie Foundation for the Advancement of Teaching. In November 2014, Le Moyne was the only institution in New York state to make the President's Higher Education Community Service Honor Roll in each of the four categories – general community service, interfaith community service, economic opportunity and education – recognized by the Corporation for National and Community Service. Brandon Johnson '15 was one of 200 students nationwide to receive a Newman Civic Fellows Award for his community engagement efforts. Dr. Lara Deruisseau from biology is the latest professor from the College of Arts and Sciences to be awarded a Fulbright Award, and will spend the next academic year conducting Alzheimer's research at the University of Eastern Finland. She also has received a $362,000 grant from the National Institute of Health for student training in biomedical sciences. History Professor Doug Egerton, one of the country's preeminent Lincoln scholars, is working on his ninth book; his eighth -- "The Wars of Reconstruction" -- was named one of the top books of 2014 by The Atlantic magazine. Le Moyne is one of only 24 U.S. institutions to receive a $50,000, two-year grant from the Council of Independent Colleges for the development of a program to promote opportunities for vocational discernment by undergraduate students. Students working with the College’s Department of Communication and Film Studies, Department of English, and Department of Visual and Performing Arts premiered a film they had been working on for nearly two years, Business Affairs, at the W. Carroll Coyne Center for the Performing Arts. Le Moyne was named to the 2015 list of Military Friendly Schools released by G.I. Jobs magazine. The list honors the top 15 percent of colleges that are doing the most to embrace America’s veterans as students. Criteria for making the Military Friendly Schools list includes efforts to recruit and retain military and veteran students, results in recruiting military students, and academic accreditations. During the 2014 Founders’ Day Gala, the College presented its highest honor, the Simon Le Moyne Award, to the inaugural Class of 1951. The event, which was held in Le Moyne’s Recreation Center, drew nearly 700 people to campus and raised more than $160,000 for student scholarships. Another event, Le Moyne in New York: A Tribute to Jesuit Leadership, honored Robert Errico ’57, Nicolena (Scirto) Errico ’59 and Francis Nash S.J., for their numerous contributions to the College. It raised more than $230,000 for the Le Moyne College Fund, which helps to support student financial aid and scholarship. During the current academic year: The School of Graduate and Professional Studies launched new programs in occupational therapy and family nurse practitioner, the Madden School of Business developed academic agreements with Fu Jen Catholic University in Taiwan and the Loyola University of Business Administration in India, and the College of Arts and Sciences has announced a graduate program in arts administration and finalized a 4+1 agreement with Syracuse University's Forensic Science School, as well as an agreement with SU's Newhouse School of Public Communications. In December 2014, the College learned it will receive $1.5 million to renovate the final two floors of the Coyne Science Center, completing the total refurbishment of Coyne into a true state-of-the-art facility. Together with the new science building opened in 2012, there is now more than 110,000 square feet of new teaching, laboratory and collaborative space for our burgeoning science, technology, engineering and math (STEM) disciplines. In September, the second floor of the Madden School of Business came online with student meeting spaces, open multi-functional academic areas, and faculty offices. Le Moyne reached a milestone in its history when The Princeton Review ranked it as one of the nation’s premier institutions for undergraduate education and included the College in its guide, The Best 378 Colleges. In achieving this distinction, Le Moyne joins the ranks of some of the most elite institutions in the U.S., as only 15 percent of U.S. colleges and universities are named to The Princeton Review’s national list. Le Moyne was also recognized as one of “America’s Best College” by U.S. News and World Report for the 22nd consecutive year. 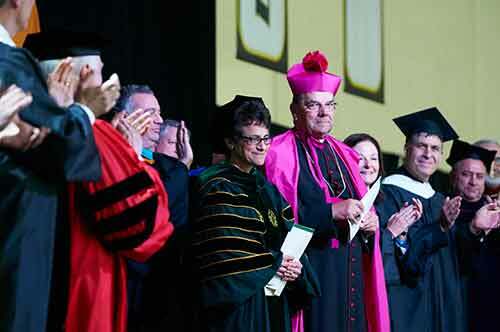 In April 2014, the new College of Arts and Sciences at Le Moyne was formally launched. Previously a division, the announcement was made at an event that also featured the inaugural Arts and Sciences Magis Lecture – that talk "Theatre of the Word: A Life in the Classroom," was presented by Dr. Robert Flower from Le Moyne's philosophy department, who is retiring after more than 40 years teaching at the College. The College dedicated the new home of the Madden School of Business in Mitchell Hall. This space, which students and faculty have been using since the beginning of the fall semester, includes a state-of-the-art trading floor and financial education center, complete with the same Bloomberg terminals used by investment firms around the world; an analytics and marketing research lab; an accounting lab; and multiple technology-enhanced classrooms. It is also the home to the Pedro Arrupe, S.J., Program for Christian Social Ethics in Business, Woodstock Business Conference and Family Business Center. For the sixth consecutive year, Le Moyne was named to the President’s Higher Education Community Service Honor Roll, which recognizes institutions of higher education that support exemplary, innovative and effective community service programs. The Honor Roll’s Presidential Award is the highest federal recognition an institution can receive for its commitment to service learning and civic engagement. Special emphasis this year was placed on recognizing service that helps youth from disadvantaged circumstances graduate from high school and prepare for college. Thanks in part to the work of Le Moyne’s Frank Ridzi, Ph.D., Sunita Singh, Ph.D., and Monica Sylvia, Ph.D., who teach in the areas of sociology, education and psychology respectively, and their involvement with the Literacy Coalition of Onondaga County, Syracuse was one of 38 communities in the nation to be designated as a 2013 Community Pacesetter for child literacy. In November 2013, the College unveiled a display that honors 13 outstanding Jesuit scientists and researchers whose work spans centuries and crosses boundaries, including paleontology and biochemistry. The wall sculpture, which was created by Brian Hanlon, a classically trained sculptor, is housed in the atrium of the new science building. Rolling Stone magazine named Communication Professor Michael Streissguth’s latest book – Outlaw: Waylon, Willie, Kris and the Renegades of Nashville – to its list of the 20 Best Music Books of 2013. Following a two-year study of the National Research Council policy on “Responding to Oil Spills in the Arctic Marine Environment,” Martha Grabowski, Ph.D., the McDevitt Chair in Information Systems at Le Moyne, briefed members of Congress and the eight agency sponsors on the findings this spring in Washington, D.C.Le Moyne was named to the 2014 list of Military Friendly Schools , released by G.I. Jobs magazine. The list honors the top 15 percent of Colleges that are doing the most to embrace America’s veterans as students. Criteria for making the Military Friendly Schools list includes efforts to recruit and retain military and veteran students, results in recruiting military students, and academic accreditation. The 2013 Founders’ Day Gala, which honored longtime Le Moyne supporters James and DeDe Walsh, drew an estimated 730 attendees. The event raised $170,000 to provide financial support to Le Moyne students. Another event, Le Moyne in New York: A Tribute to Jesuit Leadership, honored Noreen’58 (honorary ’95) and Michael Falcone (honorary ’89) and Charles Currie, S.J., for their numerous contributions to the College and to Jesuit education. It raised $160,000 for the Le Moyne College Fund, which helps support student scholarship and financial aid. Work was completed on a $3 million renovation to the LaCasse Dining Center, primarily sponsored by Sodexo, the College’s food service provider. The new dining center is set up to be similar to a food court, with multiple stations where food is prepared to order. As many local ingredients are used as possible. 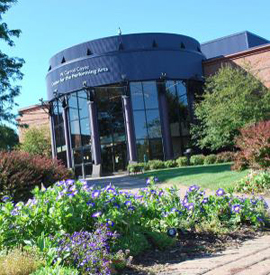 The College earned accolades for its academic excellence and value in several national rankings. For the fourth consecutive year, Le Moyne was named one of the best colleges in the Northeast by The Princeton Review and, for the 21st year in a row, U.S. New and World Report ranked Le Moyne as one of America’s “Best Colleges” based on its academic quality. The College also was named one of the 500 best colleges in the U.S. by Forbes magazine for the fifth time in as many years. Members of the Le Moyne community joined people around the world in offering prayers of support to the newly elected Pope Francis, the first Jesuit pontiff in history. Numerous TV, radio and print reporters interviewed members of Le Moyne’s Jesuit community about the selection of the new pope. Le Moyne unveiled its first Alumni House. Located at 546 Fayette Boulevard, the home has been refurbished to serve the needs of alumni, with meeting spaces, high-speed Internet access, and a large-screen television with USB and computer capabilities. It also serves as the home to Le Moyne’s Office of Alumni and Parent Programs. Kelsey Woodrick ’13 was selected for a Fulbright U.S. student award for 2013-2014 in Thailand, where she will serve as a teaching assistant in English classes. Sponsored by the U.S. Department of State, the highly competitive Fulbright program provides funding for students, scholars, teachers and professionals to undertake graduate study, advanced research and teaching. Woodrick majored in English with concentrations in literature and Teaching English to Speakers of Other Languages, and minored in anthropology. Several innovative academic programs were introduced at the College, including a Higher Education Leadership Certificate, Adult Education Certificate and Certificate in Health Care Leadership. Le Moyne Provost Linda LeMura, Ph.D., was one of only 14 individuals selected to represent the 28 Jesuit colleges and universities in the U.S. at a meeting with Adolfo Nicolás, superior general of the Society of Jesus. The participants discussed the future of Jesuit higher education, the challenges it faces, and how they can work together to nest prepare their students for success. Le Moyne received a $2 million grant from New York’s Regional Economic Development Council program. The funds will be used to assist with the renovation of Mitchell Hall, which will house the Madden School of Business, and the Coyne Science Center, which is being renovated as part of a $45 million investment in the sciences at Le Moyne. Several nursing students and faculty members traveled to Worawora, Ghana, where they volunteered at a remote hospital; conducted vision, hearing and blood pressure screenings at two clinics in the area; and visited patients in their homes. In addition, Mary Springston, director of the College’s physician assistant studies program, traveled to the Republic of South Sudan, where she worked with officials from the country’s Department of HIV/AIDS to deliver medicine, supplies and educational materials throughout the area known as Torit. The 2012 Founders’ Day Gala, which honored alumni and longtime supporters of the College Armand ’57 and Joan ’88 Cincotta, drew an estimated 700 attendees. The event raised $185.000 to benefit Le Moyne’s scholarship programs. Meanwhile, another event, Le Moyne in New York: A Tribute to Jesuit Leadership, was held to honor Mike Madden ’71 and J. Donald Monan, S.J., for their innumerable contributions to the College. It raised $130,000 for the Le Moyne College Fund. The College hosted a series of events to mark the 50th anniversary of what is widely regarded to be the most significant ecumenical event of modern times, the Second Vatican Council. The events – which included two public lectures by prominent theologians and a concert featuring music inspired by the council sought to establish a dialogue about the role the church plays in people’s lives today. Martha Grabowski, Ph.D., was selected as the inaugural McDevitt Chair in Information Systems. In this role, Grabowski works on some of the newest frontiers of large-scale systems research. Grabowski, who has been at Le Moyne since 1987, has served the College as a professor of business administration and director of Le Moyne’s information systems program. 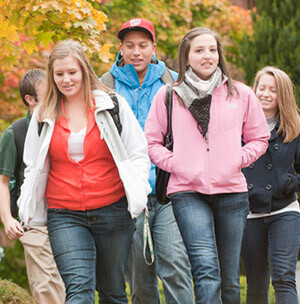 Le Moyne was named to the 2013 list of Military Friendly Schools, released by G.I. Jobs magazine. The list honors of the top 15 percent of Colleges that are doing the most to embrace America’s veterans as students. Criteria for making the Military Friendly Schools list includes efforts to recruit and retain military and veteran students, results in recruiting military students, and academic accreditations. Founded in 1946, Le Moyne is the second youngest of the 28 Jesuit colleges and universities in the U.S and the first to open as a co-educational institution. The College is named for Simon Le Moyne, S.J., a Jesuit priest, missionary and teacher with a considerable influence on Central New York. Le Moyne’s first classes were held in downtown Syracuse before excavation began on the former Gifford Farm. In 1948 the College’s first two structures, now known as Grewen Hall and the Coyne Science Center, were built. Learn about the early days from those who were here. • top 25% nationally for top English departments - USA Today.